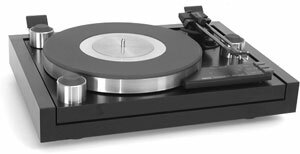 The PF-800 is so close in performance to the PF-1000 that it may be the only turntable in this class that can rival it. There's the same emphasis on performance over gadgetry, although like the PF-1000 it does incorporate an automatic arm lifter mechanism that goes to the trouble of lifting the arm at the end of the record and shutting off the motor for you. And it also shares such advanced features as the dynamic balance twin-pipe straight tonearm, Double Float Suspension System, two-piece platter, and everything else that matters. There's also the same attention to style and detail that separates this remarkable turntable from the ordinary. Indeed, to make the PF-800 an attractive alternative to the PF-1000, we substituted zinc for gun metal as the material for the inner platter, which allowed us to retain the same outstanding vibration-damping characteristics. And instead of real American walnut, we finished the cabinet in striking black, which elegantly complements the popular black finish component systems preferred by many audiophiles. That's it. So the choice is yours. We couldn't make it, so we made the PF-800 in the PF-1000's tradition of uncompromising audio performance. Yamaha PF-800 / PF800 owners manual, service manuals and schematics are for reference only and the Vinyl Engine bears no responsibility for errors or other inaccuracies. The PDF files are provided under strict licence. Reproduction without prior permission or for financial gain is strictly prohibited. This website is not affiliated with or sponsored by Yamaha.